If you are upside down in your car loan, then you will probably have to talk to your finance company at some point. They may want to offer you different terms to help you with the vehicle, or you may have to pay the balance first before they will even think about refinancing. It's often not a good deal because you may end up owing more than you want to on your vehicle. In that case, it's better to look at trading in your vehicle. 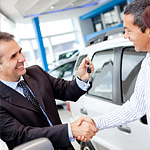 In this scenario, you get a vehicle that is lower cost and the dealer or finance company buys back your car. You save money this way because your vehicle is paid off and you typically have very little to no payments on the car you trade for. However, this depends on the equity in your old car. You can see all of your options by visiting The Car Store.